The NBA is Damian Lillard’s day job. He’s already defied expectations, he’s still fighting for respect. Despite being a former Rookie of the Year, the owner of a nine-figure contract, and architect of one of the coldest offensive games in the league, Lillard, one of the top 10 scorers in the NBA, is the year’s most egregious All Star snub. As last fall proved, though, the Oakland, California, native is just as excellent in regard to another form of creative expression: music. 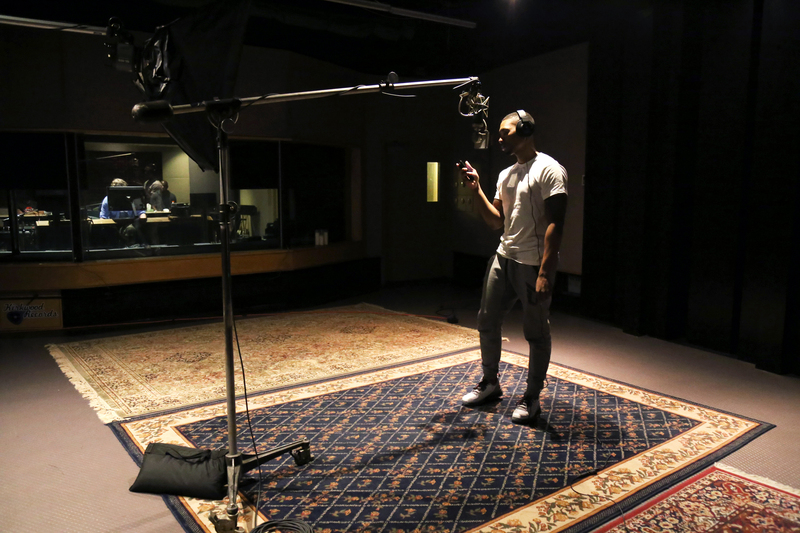 Beats and rhymes are as central to Lillard’s life story as the impeccably timed crossover that makes him a star. 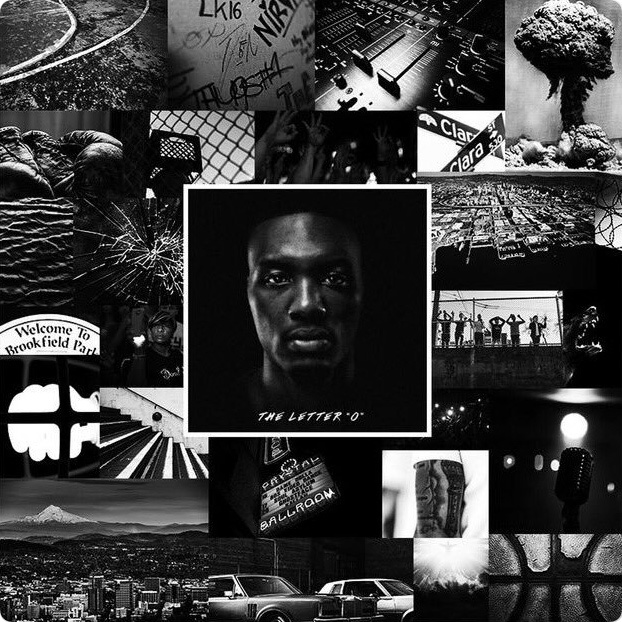 On Oct. 21, 2016, Lillard — stage name Dame D.O.L.L.A., an acronym he revealed in February 2016 that stands for Different on Levels the Lord Allows — dropped his debut album via top streaming sites. “There’s no bulls— to the man,” said O lead engineer Chris Henry. “This is the real deal.” Henry had just finished working with Justin Timberlake and Earth, Wind & Fire when he was invited to work with Lillard. “He applies that same sort of intensity in the studio … that he does on the court.” The Letter O is drenched in philosophies for victory. Here, the producers, artists, and executives who helped make Lillard’s dream a reality recall last summer’s labor of love. Each song is memorialized. Lillard’s no stranger to people doubting him. So it makes sense that he addressed the elephant in the room with the project’s opening number. Basketball is still first in his life, so he had training sessions planned with his former coach from Weber State who’s now at Boise State. He worked out with Phil Beckner [then director of basketball operations] in Utah. He’d work out in the morning and do demos on his computer. That was kinda the first record that sparked me working with Damian, period. I sent that beat to his A&R Derrick [Hardy]. Derrick called me like a week later saying Damian loved it, and he’d recorded to it. Hardy says, ‘Dame’s working on an album, and we wanna get you to L.A.’ I was like, ‘Bet. Let’s do it.’ That was the record that started everything. Like many who leave the block for college, Lillard’s experience away from home proved paramount for self-growth. He wrote it when he was in Utah at [Wasatch Front], where he was training. But I was there when he was laying it, and the energy was real dope. It’s about his experience growing up – from a boy, to a man in college. But it’s also about his relationship with his assistant coach in college, Phil Beckner [then director of basketball operations]. He was writing that song in between workouts with Phil in Utah, at Weber State. I thought that was dope. He was being reminded of all that and being inspired in that moment. Two former high school teammates connect on a different type of fast break. Dame is always talking about how his friend Dupre’s real name is Drake. And we weren’t going to be able to say ‘featuring Drake’ on the album. (Laughs). It was a bit more difficult for me, because I haven’t been in the studio as much. But he was there throughout, to help, and … he trusted me to deliver. We were there from like 12 a.m. to 12 p.m., every day. He put in the work. Dame never said how important it was for people to respect him as an artist as they do a ballplayer. … Me and him had personal conversations, though. Just about where he wanted to take it musically. He was dedicated to making sure he’d wow’d people with his skill set. Going in, he wanted to break that boundary of athletes being boxed in. He wanted to let everybody know you can do multiple things that you’re passionate about. I don’t have to just be great at one thing. I can be great in the music realm as well. This was the second day I had came because the first day he had recorded ‘Wasatch Front.’ As I was playing tracks from my iTunes, I had it set to go to the next one. But I had gotten a message, so I was all on my phone while the beat was playing. Actually, the ‘Growth Spurt’ beat played by accident. That wasn’t one that I had picked out originally. So I immediately went to the next one, and everyone was like, ‘Whoa! Whoa! Whoa! Go back!’ So I’m like, OK, cool. He stood up, and then his boy Drake [Dupre] and they just started instantly looking at each other going back and forth. The whole time my finger is ready to go to the next one, but they were like, play it again. Success, and sacrifice. Just two of the many topics running through Lillard’s mind. The first thing I thought of on this record was to ask these guys if there was a sample on the beat because I know Like likes to use samples. I was on that the entire time. We’re not clearing a bunch of samples! (Laughs) But the beat was fire, man. I always had a special place for the artists/ballers, dating back to eighth grade when me and my bro freestyled for and kicked it an entire day with Kobe [Bryant] when he came to visit our school during his rookie season. It was no different with Dame, especially him being from Cali. Anyway, fast-forward, I sent the batch of beats over. He picked this one called ‘Rozay.’ I named it that because it felt like a MMG beat. So, fast-forward, by the time we’re all in the studio, Dame walks in a little later, and the first thing I notice is that he looks a lot bigger than television says. You always think, ‘I could probably ball him up. I probably could score on an NBA player.’ I don’t think I could now. (Laughs). Dame and I didn’t talk about sports or any of that. He came in, and he was immediately focused, locked in. He spit to a few songs. I was impressed, man. He didn’t stumble once. He was very professional, on point. You can tell he has a crazy work ethic. And he did all of that without cursing. I was like, ‘Man, that’s even crazier.’ You know how hard it is for a rapper to not curse? And still be taken serious? I was impressed. There’s no way Lillard, Duece and Danny can pay Cecelia Johnson back, but the plan is to tell their grandma that they understand. You hear a lot of songs about moms, but you don’t hear too many about grannies. We spent a lot of time over at my grandmother’s house. She was pretty influential in our lives. Our parents, they all worked a bunch of jobs. My mom and Damian’s mom and a couple other of cousins’ moms would drop us off at our grandma’s house. We kinda grew up there. She’d come home and there be 10 kids. She’s a big place in our hearts. I had no clue Dame is as good as he is. I didn’t expect him to have as much heart, and as much passion about music as he does on the court. It’s the same thing. It’s seamless. Listening to him, I still couldn’t put it together in my head that this was the ball player I watch on TV killing it every night rapping like that. I said, I have to go to this session. And at the time I was 7 1/2 months’ pregnant. I wouldn’t come out the house for people I know for real (laughs)! Marsha came in towards the end of the sessions. She listened to the song for like two minutes and was like, ‘I’m done writing.’ We were like, ‘What do you mean you’re done writing?’ She was over there eating a Chick-fil-A sandwich (laughs), playing Candy Crush, and wrote it in her head in like two minutes. Oh, yeah! I did have Chik-Fil-A. (Laughs). That was the craving at the time. Immediately, she spits out this chorus. And in about 30 minutes, she stacked up about 24 tracks of vocals that sounded like angels. It’s amazing when you listen to it. That’s a situation where everybody vibes. Everything sort of locks in together. I’ve worked with a lot of rappers. You can check my résumé. Dame is no different, and that says something. Then, when people heard the album, you couldn’t ignore it. You couldn’t deny it. We joke back and forth when I say, ‘You know what? You’ve now finally beaten Shaq because Shaq was all-time with ‘Can’t Stop The Reign’ [featuring The Notorious B.I.G.]. 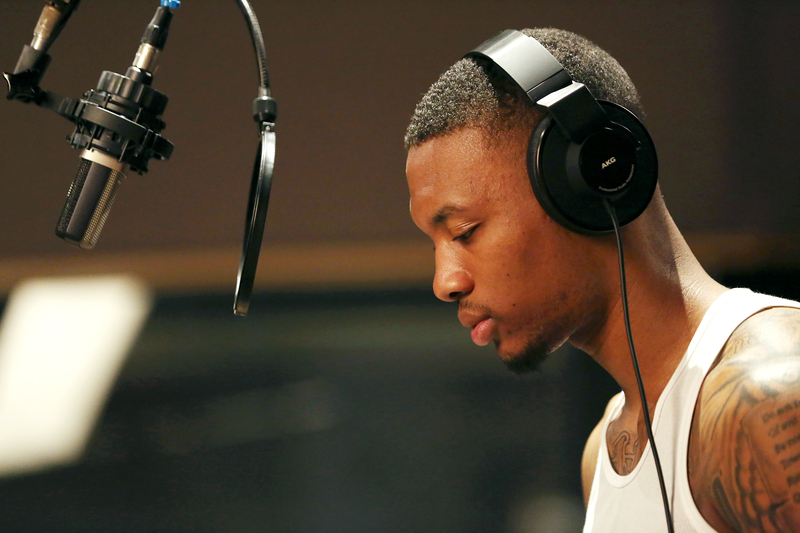 You might go down as the best rapper to ever come out of the NBA.’ With Dame, I was like, ‘No, you’re rapping. This is real. Are you ready for what this is gonna be?’ He was like, ‘Look, I’m just passionate. I just really wanna do this.’ I’ve worked with a lot of people and you are no different. That meant so much to him. And that meant so much to me to be a part of a historical moment for him. Then, you know, getting up the next day when the album is released, I’m like, look, you’re in the charts! People are paying attention to what you’re doing! He was like, ‘I was expecting more hate.’ I was like, from who?! The naysayers, the deniers? No, it’s all love. That’s what it should be. Because you’re speaking the truth. It’s honest, sincere, and your delivery is as prolific and as real as anyone you would consider a counterpart. Lillard was only a year old when Jamie Foxx debuted on In Living Color in 1991. A quarter-century later, the most complete entertainer of his generation connects with Portland’s franchise point guard. I’m not really a person to say you can or can’t do something when it comes to your artistic expression. I thought it was fresh, man. Dame Lillard, man, you know … he’s humble with it. Just like he plays on the court. After BP [The Producer] played ‘Growth Spurt,’ he played ‘Plans.’ I remember the same type of reaction. Everybody just started writing. Manny [Lotus] did a great job writing on that record. Dame showed his versatility on that one … as a basketball player you’re seen as strong, tough. I think he got to a place where he said he could do something for the ladies. Dame just wants to get his music out there. It’s not about limelight. He just wants people to feel him musically, and that’s why I wanted to be a part of it. Dame D.O.L.L.A. pauses while reading over lyrics during a recording session. A young Lillard loved Juvenile and Cash Money’s sound — in particular Juvenile’s 1998 classic “400 Degreez.” Nearly 20 years later, they’re musical colleagues. When I got off the plane in L.A., we had to work … I just grabbed the aux cord, and this was one of the first beats I played. Danny [from Sobrante] started hollering the hook. After he did that, man, we just went from there. Damian went in the booth and did his thing. It really doesn’t take him long to write his verses. That’s one of the first songs we did. Dame drove that one home as far as he had already had it written. He really had what he wanted Juve to do. It was just me coming to pen my part and place my puzzle piece next to the one that fit. I think Damian told me, ‘Hey, bruh. We ’bout to send this to Juvenile and see if he like it.’ So he sent it to him and maybe like two hours later Juve hit him up saying he loved it. He sent the hook back to us the very next day, bruh. It happened quickly. I got a call saying Dame was working on an album and needed some beats. I was like, ‘Well, is he serious?’ I never really questioned his rap skills. He was nice at rapping. But it was just … is he actually gonna put something out prior to the season? I was like, ‘Who is this?’ because I didn’t think it was him. I thought it was someone that wrote for him. Sometimes when people have someone write for them, they record it themselves, so I thought it was the writer. Then I listened to it a little longer. I mean, I liked it off top. Then I started to notice that really was him! And — he spittin’! [Lillard] walks in and sees me and he’s like, ‘Swiff, I’m a fan of your stuff.’ And I’m like, man, I’m a fan of you. (Laughs.) He’s like a student of the game. He hears something tight and he automatically just starts rapping. He seems really hungry for this. Dame didn’t use any profanity on the album. All the features didn’t use profanity either. But I was like, if anybody is gonna use profanity, it’s gonna be Wayne. (Laughs.) But when I listened to Wayne’s verse, and heard it was fire and heard he didn’t curse, I was like, yeah, he’s in his bag. The reason why I didn’t cuss — I don’t even know. When you write something down, you … put a lot more thought into it because you’re actually looking at it. It’s just that simple. Me? I don’t write. I just go off the top of my head. I just go on and I kinda sharpen the thoughts that did come to my head, and I make ’em rhyme. I probably just didn’t cuss, honestly. The subject matter didn’t require cussing. Sometimes when you get the athletes that try to rap, they try to take on a persona other than themselves. What I mean by that is, when they step off the field or off the court, they try to be the definition of a rapper. And what I mean by the definition of a rapper is, I guess, we’re ‘hard,’ or our pants sag, or our clothes are big, or I guess we wear dark shades, or, I guess, we wear a lot of jewelry. That’s what I mean. So when they try to be a rapper, they try to be that rapper. None of us are that rapper! None of us are the definition of a rapper. All of us are individually ourselves. When I heard Dame being that, that said a whole lot. He wasn’t talking about hanging on no corners. He wasn’t talking about homies that hang on corners. He was just being positive in a verse. And that’s hard to do these days. It’s hard to be positive! Dame’s verse wasn’t about ‘stop the violence,’ but it was a positive verse in a nowadays way. And I haven’t heard that from no one. I believe that’s actually him and it wasn’t because the song was positive. For him to be able to do that, and that’s who he is — and that’s who he’ll be as an artist — if I’m going to get a 10-, 11-, or 12-song album out of that person and it’s gonna sound like that, I don’t believe only my ears should listen to it. I believe the world should listen. “The Letter ‘O’” album cover artwork. The most energetic song on an otherwise mellow album is dedicated to the environment that raised him, flaws and all. We went to a day party that day. So we were chilling and hanging out and getting each other’s vibes. I played the beat, Damian rapped in his head for a little bit and went in there and killed it. It was dope to do a song for our neighborhood. We grew up in Brookfield. We talked about a lot of stuff that goes on in the ’hood. I named myself Brookfield Duece because I wanted to speak for people who couldn’t speak for themselves. Returning to the album’s more chill roots, Lillard and Manny Lotus redirect the narrative. They knew I had worked with Trey [Songz] prior. I wanted to give them a R&B vibe but still keep that hip-hop thing to it. My homie Manny [Lotus] went in the booth and did a rough. Damian heard the hook and liked it. It’s a reminder of how lucky we were to have Chris [Henry; engineer] working on the album. He listened to it and recommended they switch up the mic. Doing so fixed the song completely. “People look at you strange saying you changed,” Jay Z said. “Like you worked that hard to stay the same.” Lillard would agree. It was a tough one. Not for Dame, but more from a mix standpoint. There’s a lot of intricate details in that particular cut that are important. They have to be all present and it’s a very delicate balance between the lyric of what Dame and Adrian are doing. It’s the perfect union when you get it right. But for me, it was a hard one. For them, they spit it out like it was no big deal. The most impressive thing to me on that is it’s a R&B song that the hook was written by a rapper, Dame’s cousin, Brookfield Duece. What actually happens when you go home? You’re done doing all your work. You’re done working out, playing the game, doing interviews, doing charity work. You’re just sitting there and think about your life. How do you actually feel about everything that’s going on and all the people that’s around you? It weighs down on you. Like baggage. You’re doing what you’re doing to get this better position and people kinda resent you. You haven’t done what they think you should be doing for them. Back in the day, slaves would run away. If the slave master couldn’t find the slave who ran away, he would come back to the plantation and beat every slave who didn’t run. He would make them feel like it was messed up to leave. It would make you hate the person who got away. This is kinda how people think now. When you make it out of the ’hood, I kinda hate you for it because you’re the one who made it out. But you kinda feel bad since you can’t do for everybody. But then you kinda feel betrayed because I’m doing my best to help people, help myself and my family, and you still look at me like I’m Hollywood. Two generations from Oakland, California, connect on the album’s outro. We knew we were gonna have to freestyle it. I didn’t have any music. He didn’t have any rhymes. It’s kinda cool because he’s a hooper, he’s a ball player, but it’s cool to just throw him on the mic. He has a vision, and I’m a visionary, too. We’re family now, so we look out for each other. His dad used to look out for me as a kid. I guess it’s just karma, man. His mom went to school with me and is the same age is me. I played instruments, so if I had any problems, Houston [Lillard ’s dad] wouldn’t let nobody touch me. We didn’t know if ‘Hero’ was gonna be on the album or not. Before Damian even decided to record an album, I was setting up different opportunities for him to work in music. The whole thing is for him to be able to legitimize Damian as an artist. Because, at the end, he is an artist, but people look at him as a basketball player first, which completely makes sense. But we want people to take him seriously. We had been looking for opportunities to do that. Yours Truly and Adidas has this program called ‘Songs From Scratch’ where they put producers and artists together. I didn’t have any doubts because he’s a Bay boy. If you from Oakland, you been through something. I knew that he had a story. And it’s just, Oakland. It’s pride. You get a dap, or you get a hug, when you say you’re from The Town. A version of this oral history appears in the current issue of ESPN The Magazine. Special thanks to Kelley L. Carter and Karen Civil for additional reporting.